Going to the hospital can be nerve wracking to most of the population, but for a person with dementia, it can be frightening and overwhelming. It’s best to be ready for when the time comes and plan ahead. A list of your parent’s medications including the dose. Health care providers including their name and number. Family contact information for hospital staff including the primary family caregiver. ID Bracelet for your parent letting hospital staff know that they have dementia and their address in case they wander. Bottles of water and their favorite snacks. Something personal that is comforting to them. This could be a small photo album, a fuzzy scarf or their favorite book. A change of clothes, including an extra pair of shoes, slippers, robe and toiletries. An extra pair of glasses and batteries for their hearing aid. Before your aging parent finds themselves in a hospital, get together a caregiving team. This includes family, friends, neighbors and community members. It may also include a senior care provider. These are the people that currently help you out in caring for your parent. Find out who is willing to spend time with your parent should they end up at the hospital. It’s important that your parent have someone with them at all times. Prepare your family member as best you can. This includes letting them know that the two of you are going to the hospital for a bit—in a calm and reassuring tone. Once at the hospital, remember to include your parent in any conversations that they are privy to. When possible, ask doctors to limit direct conversation and talk privately with you, their primary family caregiver. Understand that your parent will likely be confused and may become agitated. Do your best to reassure them and let them know that they are safe and someone will be with them at all times. Listen to soothing music and minimize background noise. Limit visitors to the number and the people that your parent is comfortable with. 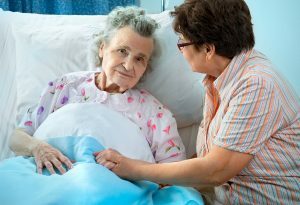 Inform the hospital staff if your parent has issues with wandering, sundowning, delusions or hallucinations. A senior care provider can provide you and your parent with the support you need. Scheduling regular respite care is essential in order for a family caregiver to give the best of care while living a balanced and healthy life. And when an emergency arises, you have someone you can count on as a member of your parent’s care providing team. If you or an aging loved one are considering senior care in Holmdel Township, NJ, please contact the caring staff at Lares Home Care 888-492-3538 or 732-566-1112.